Approximately 50% of all females will have a urinary tract infection (UTI) in their lifetime. Most females with UTI will have an uncomplicated infection that does not require urine culture. Avoiding unnecessary urine testing can reduce the burden on laboratories and decrease costs without compromising care. * Sentinel urine cultures may be appropriate in some circumstances, however, the local laboratory will usually indicate this. This audit focuses on females aged between 15 – 55 years. When a female within this age group presents with symptoms of UTI such as dysuria, frequency, urgency or suprapubic pain with no other complicating factors, an uncomplicated UTI is likely. In this group, empirical antibiotic treatment is indicated and there is no indication for urine culture. If a female had features that indicate the UTI may be complicated, urine culture is appropriate. 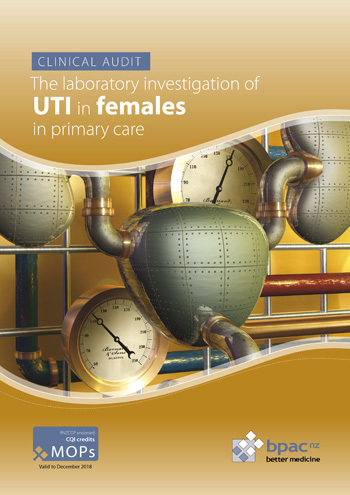 A recommended audit standard for this audit is for 80% of females aged 15 – 55 years who have had a UTI in the previous twelve months to have either had no urine culture requested, or if a urine culture was requested, had an indication recorded in their notes that justifies the test. Ideally, there should be an improvement in audit standards bewteen cycles one and two. Any female enrolled in the practice aged 15 – 55 years who received a prescription for trimethoprim in the previous twelve months is eligible for this audit. N.B. If a sentinel urine culture has been requested by the local laboratory for females with uncomplicated UTI, exclude these patients from the audit. You will need to have a system in place that allows you to identify these eligible patients. Many practices will be able to identify patients by running a ‘query’ through their PMS system. Identify all female patients aged 15 – 55 years who have received a prescription for trimethroprim in the previous twelve months. Trimethroprim is being used as a proxy measure for UTI in a female, as not all practices will code every case of UTI with a Read code in the clinical records. Some patients may be missed, but searching for trimethoprim should identify the majority of females with a UTI seen in primary care. The number of eligible patients will vary according to your practice demographic. If you identify a large number of patients, take a random sample of 20-30 patients whose notes you will audit (or the first 20-30 results returned). Use the data sheet to record your data. A positive result is any patient who has a either a “Yes” in column A and a “Yes” in column B or a “No” in column A and a “No” in Column B. Any patient who does not have two “Yes” or two “No” answers recorded is a negative result. Calculate your percentage achievement by adding up the number of positive results (those with a tick in column C) and dividing this number by the total number of patients audited.